Massospondylus were one of the strangest dinosaur. They were herbivores. The word Massospondylus is pronounced like mas-o-spon-di-lus. 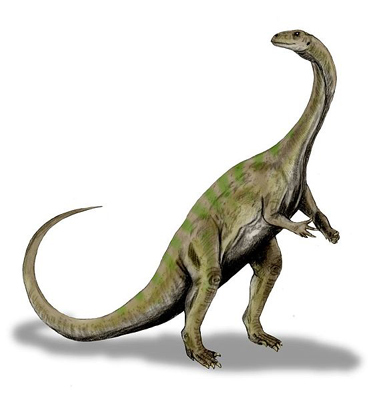 Massospondylus was known to be lived in North America and Southern Africa during the late Triassic period to the Early Jurassic period which is about 200 million years ago. It is said to be a strange dinosaur because of the shape of its limbs and the body. Massospondylus had a small head on the end of a long and flexible neck. It has two hands and two legs. Each of its hands had thumbs outfitted with a large claw and four other fingers. The arms of this dinosaur were known to be used both for grasping and for walking. The length of Massospondylus was about four meters (i.e.) thirteen feet long and its height was about 1.8 meters (i.e.) six feet tall at the hips. An adult Massospondylus would weigh around 1.5 tons. The long neck of Massospondylus would have helped it to reach the top branches of the trees easily like a giraffe. The leg of this dinosaur is slightly longer than its arms. The dinosaur also had a long tail. Massospondylus were known to be the fast runners as compared to other dinosaurs and this dinosaur is known to be had a lower intelligence as compared to the other species of dinosaurs. The intelligence was measured by the relative brain to body weight, which is also called as EQ. The first remains of the animal were known to be found in the 19 th century and it got the name Massospondylus from Sir Richard Owen, who gave this name, in the year 1854. The word Massospondylus means massive vertebra and it indicated the skeleton of the animals' neck. As said previous, Massospondylus is a plant eating dinosaur and it like other birds; it is also believed to have consumed stones called as gizzard stones for the purpose of digestion of the tough plants ate by them. Massospondylus might have had the capacity to regurgitate the stone once the stone becomes smooth and soft from its stomach after which it might have consumed new stones as and when required. This was found with the help of piles of polished stones found in the skeletons of this animal. The fossilized skeletons of Massospondylus were found in South Africa and apart from the skeletons, the fossilized eggs of this animal were also found in 1970s. From the eggs and the bones, it was found that the young Massospondylus would have been born without teeth and the young ones would have been helped by adult Massospondylus for eating purpose since it was toothless. Massospondylus was a found to be closely related to the lizard family and was a member of the saurischia family of dinosaurs. According to the scientific classification Massospondylus belonged to Animalia kingdom, chordata phylum, sauropsida class and dinosaurian superorder. It is also known to belong to the order Saurischia and suborder Sauropodomorpha. Its infraorder is Prosauropoda and it belonged to the Plateosauridae family. For more information related to dinosaursvisit rareresource.com.